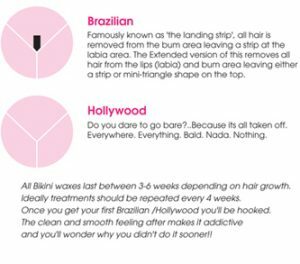 Here at the Studio, bikini waxing is our speciality, but we know our lingo can be confusing! And remember! Come back within 5 weeks and you can avail of our Maintenance Wax! Which means you get €5 OFF your Californian, Brazilian or Hollywood! Our therapists are highly skilled. We specialise in waxing and it is our objective to put you at ease and provide you with a super wax treatment. Your modesty will be protected as much as possible with fresh towels, and disposable underwear is provided. Please don’t worry – it’s our job, and we’ve seen it all before. Some women find they are particularly sensitive in the day or two before their period. If this applies to you and it is your first treatment, try scheduling your treatment for after this time.